“Living carpet” and “green manure/cover crop”—these are terms used to describe the practice of maintaining a plant-based mulch to protect and enhance the soil. But why bother to intercrop maize with a legume if the maize plants will shade the ground soon enough? First, plant growth is influenced by soil temperature. Maize, for example, has optimal root growth between 23-25oC (Brady and Weil, 2008). Soil temperatures above 26oC restrict root and shoot growth of maize seedlings (Walker 1969). In the warm tropics, therefore, the cooling effect of an early-season “living carpet” would be beneficial to maize. Secondly, leaf litter from the legume crop decomposes over time, resulting in an organic mulch layer that conserves soil moisture (Lal, 1995) and enhances nutrient retention and microbial life. Lastly, cowpea grown with maize helps suppress weeds and provides the farmer with a food source (dry beans) before maize harvest. 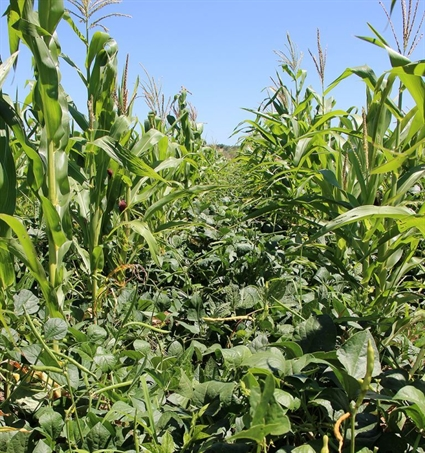 In an ongoing FFF trial, rows of a creeping cowpea variety (IT98D-1399) were alternated with rows of maize. The FFF-style planting stations (basins 15 cm deep) were dug 60 cm apart within rows, with 50 cm between the rows [NOTE: recommended FFF spacing calls for 75 cm between rows of planting stations; for purposes of this trial, we reduced the between-row spacing to 50 cm so that, with alternating maize/cowpea rows, there would only be 1 m instead of 1.5 m between rows of maize]. Cattle manure was placed in the planting stations (500 ml of manure/station) at the end of August, during the winter dry season. Maize and cowpea were planted on 22 November 2013, as soon as there was enough rain. The maize planting stations received a micro-dosed (5 grams per station) side-dressing of NPK (12% nitrogen; 9% phosphorus; 12% potassium) fertilizer on 15 Jan 2014. By the 6th week after seeding the maize, the cowpea canopy was 50 cm wide, corresponding to 50% soil coverage. Two weeks later, cowpea had completely covered the soil with the canopy width ranging from 97 to 111 cm. At 10 weeks after seeding maize, the cowpea canopy showed a noticeable cooling effect on the soil; soil temperature (0-7 cm depth) decreased from 35oC with maize alone to 30oC with maize/cowpea. By maize tasseling stage (nearly 12 weeks after planting), the cowpea vines had begun to produce harvestable pods (see figure below). Keeping soils covered is a key component of conservation agriculture. Yet, organic mulch is often missing from smallholder farmer fields due to competing uses for crop residues. A legume such as cowpea may be able to help provide the needed soil coverage. In our study, it did so fairly early in the season without negatively impacting soil moisture/fertility or maize growth. Brady, Nyle C., Weil, Ray R. 2008. The Nature and Properties of Soils. 14th edition. Pearson Education Inc.
Lal, Rattan. 1995. Tillage Systems in the Tropics: Management Options and Sustainability Implications. 71st ed. Rome: FAOSoils Bulletin. Google Books. FAO 1995. Web. 21 Mar. 2014.